An account of the bravery of the police force during the events surrounding the unspeakable April 15, 2013 Boston Marathon bombings. In the brutal aftermath of the explosions, the courageous Sgt. 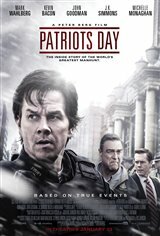 Tommy Saunders (Mark Wahlberg), FBI Special Agent Richard DesLauriers (Kevin Bacon), Commissioner Ed Davis (John Goodman), Sergeant Jeffrey Pugliese (J.K. Simmons) and nurse Carol Saunders (Michelle Monaghan) spring into action to help those injured and track down the terrorists responsible for the catastrophic attack. The guilty men are revealed to be the Tsarnaev brothers. As lives are lost and fear runs rampant, a select group of individuals rally to combat hate and demonstrate heroism. Ultimately, the unwavering strength and remarkable spirit of Boston is displayed.